Where Can I Buy Cheap, Customized T Shirts Online in India? Considering the popularity of customized T- shirts in India, everybody loves to own one. Although, cheap customized T- shirts in India online are pretty hard to find, you can easily see its craze in almost every part of India. In whole India, the trend of customized T- shirts are getting more and more popular whether it is in New Delhi, Gurgaon, Noida, Bangalore, Karnataka, Mumbai or Tamil Nadu. But many times, your budget doesn’t allow you to customise it fully as you wish as most often websites charge you extra money for customizing a T- shirt. For buying cheap customized T- shirts in India which also offer you quality, you can consider checking the Alma Mater Store. This store offers really affordable prices for customized T- shirts and only hikes them if you add several layers to it. The more layers there will be, the more the T- shirt will cost. You can expect the best service from them without burning a hole in your pocket. Printland.in is one- stop shop for all your personalized products needs as it has a wide range of products which you can personalize. Talking about personalized T- shirts, here also you get several options to choose from which differ in prices which let you easily select the T- shirt which suits your requirements the best while fitting in your budget. 99tshirts.com is the one website which aims to offer you the best prices always. Also, mostly there are different special offers going on which also helps you in saving more money on your purchase. You can also find a special tab on the website for checking out the products on sale and consider buying them in order to save your money. You can customize T- shirts on Inkmonk by their styles like round neck and collar neck. You can also choose the type of material you want, fabric colour, print type, font type and size, print size and more. The price of the product will depend on the options you choose. 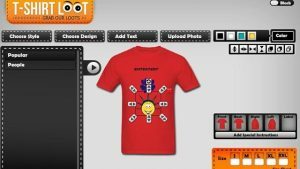 So, you can carefully select the options and customize the T- shirt making it fit in your budget. You can almost always find a discount going-on on T- shirt Loot. 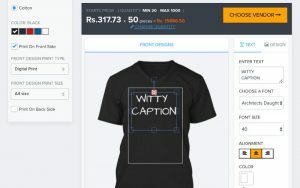 So, you can buy cheap customized T- shirts in India from here. You get enough options to customize the T- shirt as you want like adding text, art or image. You can not only customize only front and back sides of the T- shirt with their tool but also the sleeves which are right and left side. There’s also a variety of products in T- shirts available for you like men’s round neck T- shirt, unisex polo T- shirt and women’s round neck T- shirt. Benefits of Online Education: How online Education is Useful?